But one expert said such technology has yet to be properly validated by scientists. Lumen has raised almost $ 2m (£1.57m) on the crowdfunding site Indiegogo. It has designed an inhaler-shaped product that measures carbon dioxide levels in the user’s breath. The firm says this provides a way of monitoring a person’s metabolism – the chemical processes that, among other things, convert food into energy. “You don’t need to guess how much sugar was in that kung pao chicken or how many calories you did on that run,” explained founder Dror Cedar. Instead, he told the BBC, the app simply explains whether the user is burning carbs or fat. It then suggests recipes that help burn fat and, over time, Lumen learns what diet is most appropriate for each user. Lumen has been trialled by “hundreds” of users in the US, according to Mr Cedar. However, studies measuring the effectiveness of the product have not yet been peer-reviewed. It will go on sale for $ 299 (£235) this summer, though people who pre-order will pay $ 250. The app might charge a subscription fee in the future, but it will be free for everyone during its first year. Conversely, FoodMarble measures hydrogen levels in an attempt to make deductions about a person’s digestive health It was released in December. Nearly one million pre-ordered devices have already been shipped, the firm has said. Founder Lisa Ruttledge told the BBC that hydrogen in the breath can be a sign that someone is having trouble digesting a recent meal. “That’s happening because there’s fermentation happening in your gut and some hydrogen created in that process is exhaled,” she said. The idea is to help people who experience bloating, abdominal pain and other gastrointestinal symptoms. Through revealing foods that result in hydrogen production, FoodMarble could help them tailor healthier diets. However, although such tests are sometimes used by doctors and dieticians, some question whether they are accurate. “There is only limited scientific research showing that these validated tests carried out in a hospital environment can tell you what foods you are sensitive to,” said Kevin Whelan, a professor of diatetics at King’s College London. This is because various factors can influence breath results – including the time taken for a meal to be digested, which is not always the same. 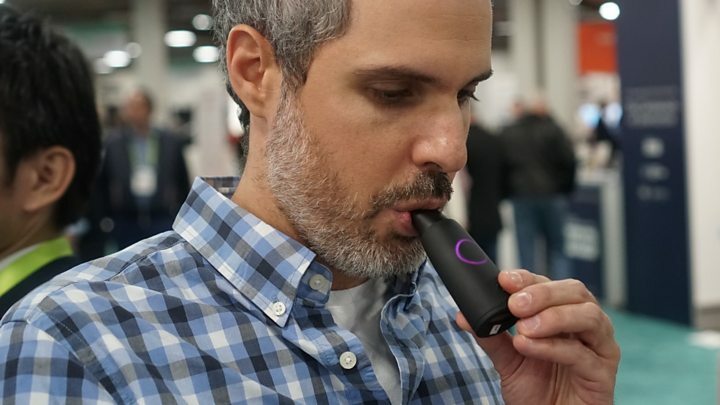 “Portable, user-driven machines that test breath gas have never been used in scientific studies to show what foods people may be sensitive to,” he added.